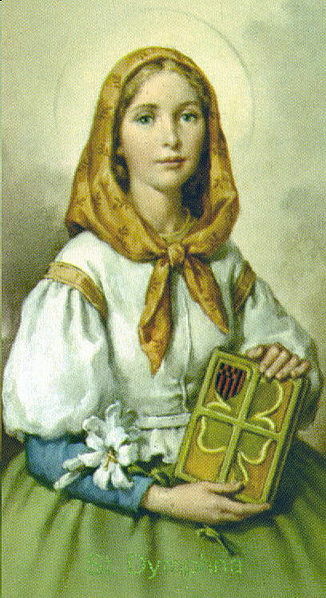 May 15th is the feast day of Saint Dymphna, the patron saint of mental illness. For more information click here. We do not know for certain how we will react in a particular situation until we are actually there. Multiple factors influence our thoughts, emotions and actions at any given moment. These factors may be outside of ourselves or come from within. As humans, we all suffer from ailments, whether it is for a week with the flu, years with cancer, or a lifetime with mental illness. We must not forget that like the flu and cancer, mental illness is not a weakness or character flaw. It is an affliction of the mind/body that colors the way our soul/spirit experiences this world. Without help it is too much for us. Have you ever prayed for someone? Do you ever ask others to pray for you? Today, I ask St. Dymphna to pray to God for me and for all those who have mental illness. This entry was posted in Meditations, Research, Reviews & Resources and tagged anxiety, bipolar disorder, depression, mental health, mental illness, saint dymphna, writing. Bookmark the permalink.